The inferior region of the skull consisting of an internal (cerebral), and an external (basilar) surface. The infratentorial compartment that contains the CEREBELLUM and BRAIN STEM. 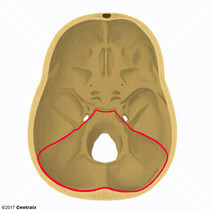 It is formed by the posterior third of the superior surface of the body of the sphenoid (SPHENOID BONE), by the occipital, the petrous, and mastoid portions of the TEMPORAL BONE, and the posterior inferior angle of the PARIETAL BONE. The compartment containing the inferior part and anterior extremities of the frontal lobes (FRONTAL LOBE) of the cerebral hemispheres. 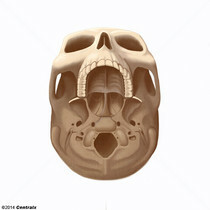 It is formed mainly by orbital parts of the FRONTAL BONE and the lesser wings of the SPHENOID BONE. The compartment containing the anterior extremities and half the inferior surface of the temporal lobes (TEMPORAL LOBE) of the cerebral hemispheres. Lying posterior and inferior to the anterior cranial fossa (CRANIAL FOSSA, ANTERIOR), it is formed by part of the TEMPORAL BONE and SPHENOID BONE. It is separated from the posterior cranial fossa (CRANIAL FOSSA, POSTERIOR) by crests formed by the superior borders of the petrous parts of the temporal bones.